Known as the ‘Queen of Couture Cakes’, Mich Turner MBE is something of an icon in the baking world. Since starting her business at the tender age of 17, Mich has baked for The Queen, Madonna, Pierce Brosnan and David Beckham. Her cakes and decorating craft were some of the first to inspire me to take baking - always a homely, understated hobby - a little more seriously. And so when Mich got in touch and sent me a review copy of her new book, Have Your Cake and Eat It, I had to pinch myself a little. This book is all about celebrating healthier recipes for everyday baking. As a qualified nutritionist and food biochemist, Mich has used her experience and know-how to bring together nutritious and delicious recipes for those looking for a healthier way to bake. This book perfectly demonstrates that eating healthily doesn't need to be bland and boring. Instead, Mich offers natural alternatives to conventional fats, flours and sugars, to add new levels of flavour and complexity to healthier baked goods. Flicking through the book, I found myself bookmarking every other page - Mich's recipes for rhubarb and sour cream squares, Lemon polenta cake with strawberry compote and Dairy-free chocolate and coconut loaf are all sitting comfortably on my to do list. 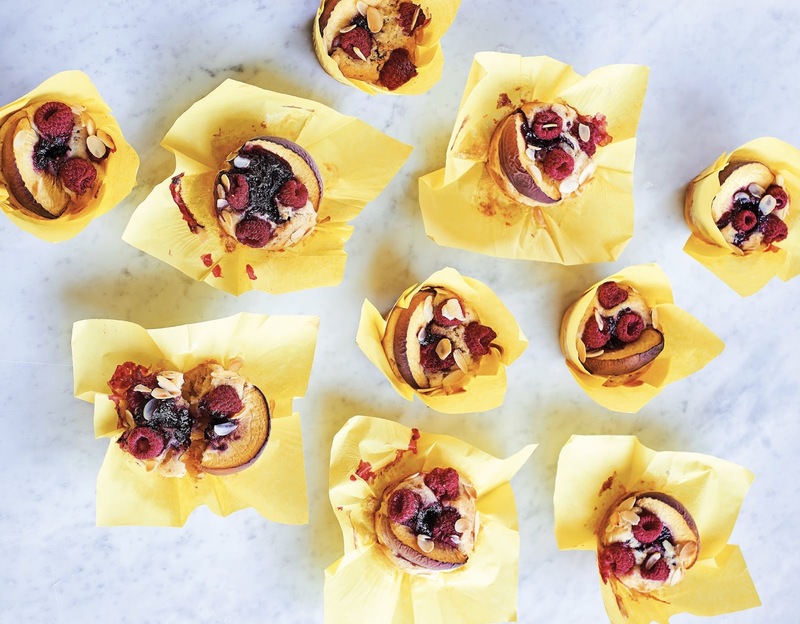 By way of a preview, Mich has kindly shared her recipe for Peach Melba Muffins with me. These naturally dairy free muffins are a revelation - packed with fresh peach and raspberries, then injected with fruit compote for natural added sweetness and flavour. Have Your Cake and Eat It by Mich Turner is available to buy on Amazon. Heat the oven to 180°C. Line a muffin tin with 12 cases. Sift the flour, ground almonds and baking powder into a bowl. In a separate bowl, mix together the sugar, eggs, oil and non-dairy yogurt. Add the flour and mix until just combined. Lightly fold in the chopped peach and crushed amaretti biscuits. Spoon the batter into the cases. For the compote, place the fruit, sugar and citrus zest and juice (if using) together in a heavy-based saucepan over a medium heat and bring to a gentle simmer. Continue to heat, stirring occasionally for about 25–30 minutes until the fruit has softened and reduced to a thick pulp. Remove from the heat. Taste and adjust the sugar or add lemon juice to taste. Spoon the smooth fruit compote into a piping bag and snip the end to make a small hole. Insert the tip just under the surface of the batter and inject about 2 teaspoons compote per muffin. Top with a peach slice, a few raspberries and some flaked almonds. Bake for 25–30 minutes before cooling on a wire rack. Store for 2–3 days in an airtight container in the refrigerator. These muffins are not suitable for freezing. Recipe courtesy of 'Have Your Cake and Eat It' by Mich Turner MBE, published by Jacqui Small. Photography by Peter Cassidy.